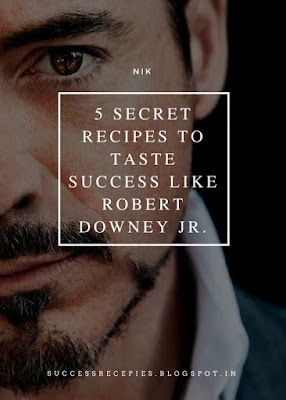 5 Secret Recipes To Taste Success Like Robert Downey Jr.
Why Robert Downey Jr. is such a big star? Robert Downey Jr. is one of the most influential people for the young generation. "I think that we all do heroic things, but hero is not a noun, it's a verb." He is one of the highest paid American actors and famous for playing Sherlock Holmes, Tony Stark (Iron Man) and many more superhit characters. RDJ used to be a singer. "The Futurist"(2004) is his debut studio album. Over 16,000 copies were sold in a just first week! Success Recepies has decided to bring you the secrets behind Robert's success. Ready to go is always better than wait for a second, let me prepare! No matter where you go, where you are- be always prepared with your suitable best outfit according to the place and situation. Just like RDJ. I am not telling you to buy branded clothes! Buy clothes that suits you. Make a smart wardrobe with the basic elements and then do experiments with them. Every time you dress well, you become more appealing. People around you will try to break the ice and start a conversation with you. That is why this is a big bonus in case if you are a shy person like me. Robert Downey Jr. has an insane sense of humor. Whether it's on screen or off screen, he knows exactly what audience will love to hear. Now other will wonder how he knows that all. But, Success Recepies follower like you doesn't need to dig a hole in search of the answer. Notice what RDJ does when someone speaks to him. He not only listens carefully but also observes the context which the speaker is trying to create. He is doing it for such a long time that now he mastered it and does so quickly which easily goes out of notice. RDJ observes the speaker, stops a little, prepares his answer and then delivers his reply. BOOM, guess what is next? He is the center of attraction, no matter whom he is with. Try this trick and see your audience love to hear more from you! Robert madly loves his profession. Remember every Sunday night, you feel bad because the weekend is over and you have to go back to the long week hustle? Clearly shows the love for what you do. Find your passion, risk your comfort zone and then hustle for your crown. Have you ever scene RDJ with a large belly fat or too thin? Being in shape can tell a lot about you. Wearing a dress that fits you, will give you the boost to express yourself without even speaking a single word. Robert is so busy exploring himself in a new way that he doesn't even have the time to copy others. Even RDJ hardly follow other's command. He makes himself as the top priority which makes him inspiration for others. Many times even you will find him to tell others what to do. That is what makes the differences. Pro Tip: Be the best version of yourself. Become a brand. Robert Downey Jr. is such a celebrity, from whom we can learn many things to make our life more successful using the above mentioned secret recipes. First Secret Recipe: People will break the ice for you to start a conversation with you. Big bonus if you are introvert like me! Second Secret Recipe: Who does not wants to sound smarter without putting oneself into the books? Third Secret Recipe: It will help you to enjoy 5 days from a week instead of just 2 days of a weekend. Fourth Secret Recipe: Want to become the center of attraction? Go read it. Fifth Secret Recipe: If you want to control things going in your life, that is the point for you. Thanks for being here, let me know in the comment section if you want the rest 5 secret recipes of Robert Downey Jr. in future posts. Tell me the name of the celebrity whom you want Success Recepies to explore next. Kindly comment down below if you noticed a point I missed. A single share from you will help to bring at least one positive change in your close one's life. Share the link to this blog with the hashtag #BeLikeRDJ to inspire others and get a chance to connect with other Robert Downey Jr. fans community of crores globally. Stay tuned for Success Recipies! Special Thanks to Giphy for the GIFs. Wow, thanks for this inspiring article about Robert, Nik. I enjoyed reading it. I will try to apply these tips and hopefully I will be as successful as him. i totally agree, if you love what you do you are instantly in a better mood. and it is so important as you mentioned to 5 days of the week then 2 days of the weekend. Agree with all these tips. Especially "Love What You Do". All great tips, especially the one about listening and observing carefully. I wish I had his success. He has really accomplished a lot! You listed some great tips. Wow I love RDJ too! I agree that listening and observing is so important. Sometimes I have to practice hard at it but I have learned that it is best. Wow ..this was an inspiring post .Personally I like him and ya i completely agree with "Love what you do". These are some amazing tips. I will certainly try to apply these tips to my life. I love this article and point of view of the celebrity RDJ. Ilove being the best versionof myself. Cool tips. I like RDJ. He is so funny and confident. I wonder if you could do a Ryan Reynolds success story as well. I love these! I'm glad he pulled through. I know he had issues with drug abuse in the past, and I'm happy he conquered that! Great tips, love how you used RDJ for everything, I mean who doesn't love him? I agree that most successful people truly worked hard and was professional in so many ways to get to where they are today. These are all great tips! Awesome tips! I love RD though. I'm glad he was able to work it out. i love robert downey jr. The photos used on here are awesome. his sherlock holmes movies are my favorite! Totally agree with these tips. Got to do what you love! I love Robert Downey Jr. I love him in all of the Iron Man and Superhero movies, and think he made a great comeback after his struggles. This is absolutely brilliant! I love him and his expressions are to die for! I love this post. I completely agree that it is so important to always dress well and be passionate about what you do. Dress for what you want, not what you have! What a fun way to look at tips for success. A good read! Great tips for success and definitely an interesting take on applying them back to RDJ. Love him as an actor! I love all of these tips, you just nailed them! Being yourself and making your brand is a process. And I strongly agree, spend time exploring yourself instead of immitating others. RDJ really has done amazingly, I definitely love him as an actor, Iron Man in particular is a favourite! Love these tips from him and you. Very inspring recipe. Never copy others is my motto. Everyone should be unique and should not try to be anyone else. Definitely an interesting take on his success. I do agree that how you represent yourself shows confidence and a good sense of self love or even self discipline. This is food for thought for me. What a great post - you know I hadn't stopped to think about how awesome RDJ actually is. I am going to think about these things next time I watch him on the big screen. He is one of my favorite actors. He's annoyingly funny. I do find truth to your words. Be the best version of yourself, love what you do and do your best to not compare yourself to others. There's just not enough time to be looking around and be awesome at what you love. I totally agree about the "don't copy others" one. If you want to stand out, you have to have your own unique personality! Some people will love it, others will hate it, but it's you! That is a really cool article. Love the way you incorporated the Gifs into the post and made it fun. I love Robert Downey Jr and I love this advice! Great job putting this together! This is such great advice! I have always thought Robert Downey Jr is a perfect role model for kids. Excellent tips! I especially love the "love what you do" tip. That's extremely important, as far as I'm concerned! Love this guy's sarcasm. Amazing how RDJ turned his life around from being an illegal drug user. I love RDJ and I'm so inspired to step up my game now. It sounds like consistency is where it's at. That can be difficult sometimes but necessary if you want to be serious about success! these are all great tips. Loving what you do gives you the motivation. I agree with all of these. And would had that haaaard work remains the biggest part! I am such a huge RDJ fan!! His portrayal of Chaplin was so nuanced and underrated, and of course I love him as Tony Stark!! Thanks for the tips on cultivating his brand of swag! What fun tips! Definitely something to aspire to follow! I love RDJ. I definitely admire him for being successful. He's just an overall great guy and I think that plays a huge part in his success. They say 'Dress like the job you want!' I'll agree. And also, successful people are very observant and they implement! Do you want to run away from your past? What others think about you is your prior concern? How your friends are getting success in spite of putting the same effort? Success Recepies decided to find out the secret key factors that will make you successful in life the way you deserved. We had picked up the top 6 relevent questions to our topic asked by the Success Recepies followers. 1. How to forget a really very bad experience?As soon as you don't make peace with your past, it will keep screwing up your present. Accept it. Analyze the reason behind it. Work on it. Congratulations, you had leveled up :) 2. What can heal my wounds?Tough times give us the wounds, that sometimes seems incurable at that moment. Instead of worsening it, give it time to heal. Remember, time is the best healer. Why the best startups are mostly made by the college dropouts? Ever wondered why the class toppers never get success compared to the last benchers? How does the weak or mediocre students' lifestyle in future generally becomes more adventurous and interesting compared to the boring 9 to 5 shifts brilliant student has to go through? To conquer this we need to understand the importance of failures in our lives. So, you can start enjoying failures instead of getting depressed and worsening the situation further.